The word censorship was not mentioned once in a draft cultural policy document published yesterday by a working group commissioned by Education Minister Dolores Cristina, but the authors of the report clearly hint at plans to remove the censorship board from the remit of the Commissioner of the Police, and place it under the wings of Cristina. The working group, chaired by the Malta Council for Culture and Arts (MCCA) executive director Davinia Galea was also made up of cultural expert and actor Anthony Attard, Education Ministry official and poet Caldon Mercieca, Culture Ministry communications officer Doriana Bezzina, and lawyer Jeanine Giglio. Government’s resolution to draft a cultural policy document comes decades late, while the government-appointed MCCA has for the past years been entrusted with Malta’s cultural development without it being given a clear-cut policy framework to work by. 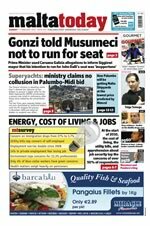 Meanwhile, MaltaToday is informed that the policy document was approved by cabinet last December. Changes in legislation proposed within the policy – such as that of classification and the legal status of artists, will now require parliamentary approval. The 130-page report also highlights the need to use a national cultural policy as a means to democratise culture, reinvent cultural education, highlight the benefits of diversity, conserve cultural heritage, incentivise and sustain the economy of culture, increase international cooperation and monitor and research Malta’s “cultural sphere”. It therefore proposes the improvement of cultural governance structures, the strengthening of artists’ professional status, the articulation of specific needs of the arts, heritage and audiovisuals, the development of the cultural and creative industries, the recognition of cultural rights, cultural socialisation and cultural inclusion; and the ensuring of long-term sustainability of the cultural sector.